Taken from Filati Magazines - Ragazza No.3: "An essential wardrobe staple that will keep you stylish looking as well as toasty warm all winter long." 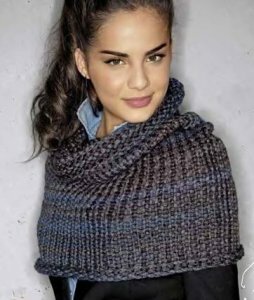 This pattern is in Filati Magazines - Ragazza No.3, page 21. US 19-24" circs (or size needed to obtain gauge) is required but not included. Finished Measurements: 35.5 (38.5)" at lower edge, 22.75" tall. Gauge: 8 sts over 4".